Directions (1-15): Improve the bracketed part of the sentence. Q1. Sonu (would had) got this offer if he had attended the interview. Q2. The fact that he (can’t be able to) sing is known only to very few people. Q3. I made him (to do) the project against his wishes. Q4. The cities are (bursting on the seams) with people. Q5. However, great you may be, you cannot (trifle on) a man’s feelings. Q6. In order to get into the gang, the boy had to perform the (sanguine) task of stabbing a man to death. Q7. Despite his father’s financial assistance he was always (hard on). Q8. 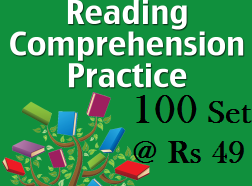 At the present rate of exchange, fourteen (dozen cost) Rs.3000. Q9. The Vice Principal decided to resign when he was (passed over) for promotion to Principal. Q10. Aspirin-related compounds (were used) for the treatment of pain since the 16th century B.C. Q11. His condition has only deteriorated, his life (hangs with threads). Q12. I won’t be able to leave for office until they (arrive). Q13. (It is no good to cry) over past failures. Q14. Why should we (bothered)? Q15. She (starts walks) without responding.